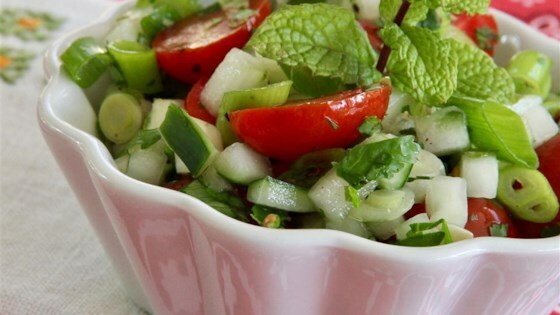 Mix grape tomatoes, cucumber, green onions, cilantro, lemon juice, mint, salt, and pepper together in a large bowl. This is one of my go to Salads! I do like to add in some olive oil too, it just adds to the goodness. This was good the day I made it, but awesome the next day. Very refreshing! I didn't have any cilantro, but didn't really miss it.